Thanks dear people of PonyDanceCycle! You can read the original article here. 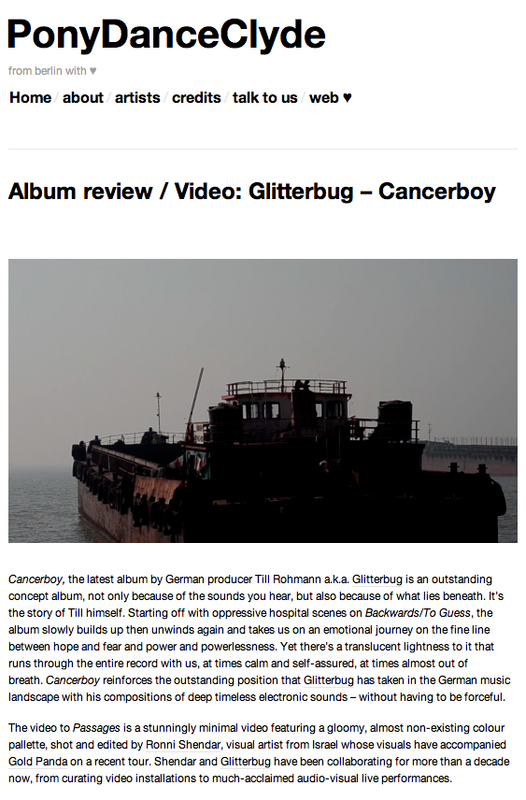 Cancerboy, the latest album by German producer Till Rohmann a.k.a. Glitterbug is an outstanding concept album, not only because of the sounds you hear, but also because of what lies beneath. It’s the story of Till himself. Starting off with oppressive hospital scenes on Backwards/To Guess, the album slowly builds up then unwinds again and takes us on an emotional journey on the fine line between hope and fear and power and powerlessness. Yet there’s a translucent lightness to it that runs through the entire record with us, at times calm and self-assured, at times almost out of breath. 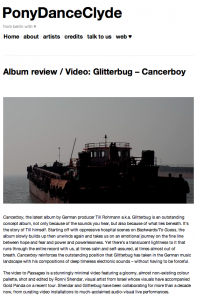 Cancerboy reinforces the outstanding position that Glitterbug has taken in the German music landscape with his compositions of deep timeless electronic sounds – without having to be forceful. This entry was posted on Saturday, May 19th, 2012 at 3:41 pm and is filed under Press / Reviews. You can follow any responses to this entry through the RSS 2.0 feed. Responses are currently closed, but you can trackback from your own site.